The Haute Couture presentations for Spring/Summer 2013 came to a close in Paris recently, as 33 design houses continued the tradition of lavish and exclusive showings of unthinkably expensive garments. Strictly regulated by the Parisian Chamber of Commerce, the title of Haute Couture is awarded only to designers who show collections of more than 35 garments, produced in Parisian ateliers, twice yearly. Each garment is made exclusively for an individual costumer, with each finely wrought detail perfected by hand: a process that can often take upwards of 300 hours. Because of such extravagance, the relevance of Haute Couture in today’s world has recently been called into question, yet it seems there is still an enduring market for ultra-luxury. Atelier Versace presented the inaugural show, offering a mix of geometric suiting dappled with 24-carat gold, futuristic evening wear and a remarkable mink coat that took over 500 hours to construct. Donatella Versace herself spoke of her surprise at the health of today’s market for Couture (Versace re-launched its public Couture shows just over a year ago) yet insisted her focus is not directed at profit but rather at keeping the handcraft of Couture alive. In the following days Couture luminaries Armani Privé, Chanel, and Christian Dior presented. Art deco motifs, sculptural suiting and fabulous retro prints stood out in the Armani Privé collection, whilst models were adorned with costume jewellery pieces that could easily belong to someone’s fabulous, eccentric great-aunt. Observers also noted that some skirts were tight enough to cause the models difficulty when walking. The Christian Dior show saw sprite-like models don feather light, intricately ornamented creations in a refreshing spring shades as they wandered through a beautiful spring woodland in place of a runway. 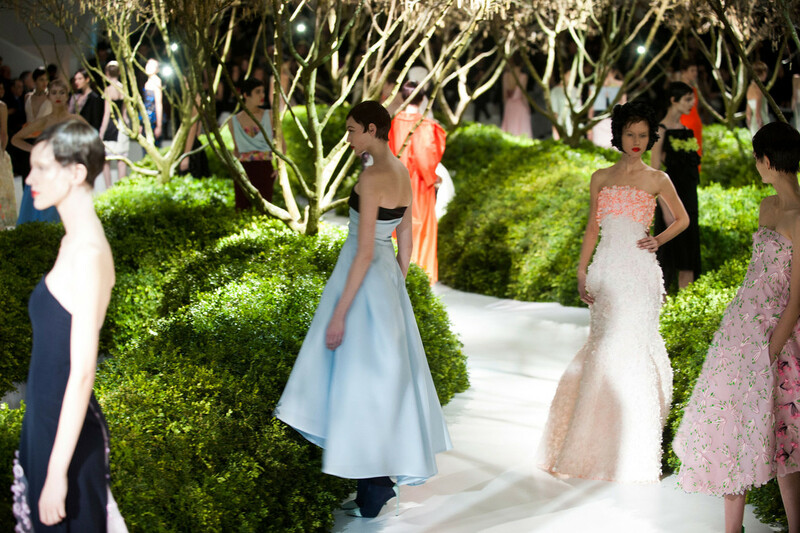 The enchanting landscape, created by Wirtz International, featured verdant bushes that gave way to slender trees, reminding us that Couture shows act not only as a platform for fashion labels, but for architects, graphic designers, landscape engineers and many other talented creators. Lagerfeld’s use of his Couture show as a platform for cultural change is admirable, yet beyond such political messages do these Couture shows contain anything of relevance to us at all? Indeed, they provide us with richly detailed, aesthetically pleasing garments and perhaps inspire us creatively, but we, like the majority of the world, are not Haute Couture customers. That designation is reserved for the relatively few people that can afford the exorbitant price tag that accompanies a Couture garment. The fact is, the patronage of Haute Couture Ateliers has seen a dramatic decline over the past 50 years with the BBC placing the number of active buyers around only 200. At the peak of the Global Financial Crisis, the decrease in the customer base was so drastic that media outlets widely touted the demise of Haute Couture, yet here it remains. Recently, the primary market for Couture pieces has seen a move from Europe and the United States to emerging economies such as China, the Middle East and Russia. Despite this new customer base, Haute Couture often fails to make a profit because of the astronomical cost of production. The French Government pays a certain portion of the expenses of French Haute Couture ateliers in order to keep the fading handcrafts and cultural traditions it supports alive. Very few designers can afford to produce Haute Couture simply because it is markedly less profitable than their Ready-to-Wear lines, which have become more popular as their quality and perceived prestige increase. While the Couture customer base is shrinking, there are still many for whom Haute Couture provides a lifelong career. Handcrafts such as embroidery, millinery, shoe making, feather work and weaving have now fallen largely to machines and very few artisans now possess the technical skill to perform such tasks. Those that do are employed almost exclusively by ateliers, who have become perhaps the last patrons of the vanishing crafts. François Lesage, whose legendary embroidery atelier served the likes of Yves Saint Laurent, Christian Dior and Chanel, spoke to the New York Times about the decline in expert artisans, ‘Since the 1920′s, when there were about 10,000 French embroiderers, the population has shrunk to about 200’. Lesage’s own atelier has only 55 staff. The number of feather work specialist has fallen from 300 to less than a handful over the course of 60 years. Many family owned, century old workshops were left without heirs in recent years, and would likely have been lost if it weren’t for Chanel purchasing six celebrated ateliers over the course of recent years, including Lemarié, a designer of flowers and feathers and Desrues, a button and costume jewelry maker. Couture seeks not only to serve the rich, but also the skilled: crafts people and artisans are rewarded by the industry. Impeccable workmanship is the soul of Couture. It must be so extravagant, so unthinkably perfect or else, or as Karl Lagerfeld has said, ‘it has no reason to exist.’ The allure of Couture lies in the luxury of being the very best money can buy. In the words of François Lesage, ‘It is a dream of quality with no consideration of cost’, a dream realised only by those with the means to spend $50,000 on a single garment. So are those ultra-riche who keep Haute Couture alive materialistic magnates or true patrons of the arts? I’m thinking Donatella Versace might be right. This entry was posted in Culture, Fashion and tagged ateliers, chanel, couture, couture week, dior, fashion, paris, versace. Bookmark the permalink.